Weapon Stats & Strategy for Revolver in Fortnite. 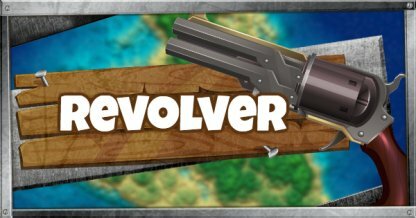 Read here to find information about the damage(DPS), rarity, and reviews for Revolver! The Revolver has been vaulted as of the v5.40 update. This article will be updated when it returns to the game. 54 54 6 48.6 2.4sec. 57 57 6 51.3 2.3sec. 60 60 6 54 2.2sec. Whether in Solo, Duo, or Squad, The Revolver's effectiveness lessens the longer a game goes. It is a good startup weapon capable of bringing down unarmed enemies. Finding the right range for the Revolver is tricky. Its damage dropoff and slow fire rate makes it ineffective in fast long-range and short-range combat. The middle range is where it is most effective. Players can quickly get their hands on a revolver as it can be easily looted from the floor or in chests. The Revolver is effective in gunning down enemies early in the game where everyone is scrambling for weapons. Two succesful shots can easily bring down an unprepared enemy. Although the Revolver has average damage, this is brought down due to its slow fire rate, taking almost a full second between shots. On average, it has 48.6 DPS. The Revolver's first shot will always be accurate at a certain range. Add to the fact that its a hitscan weapon and it makes connect first shots easier against stationary enemies. Utilize the accurate first shot of the Revolver to get head shots. One successful head shot with the weapon will amount to 120 in damage, enough to knock down an unprepared enemy. The Revolver in its own is risky to use. Have another weapon in your loadout and switch between them depending on the situation.